A new giftbook series by famed nature photographer Mal Austin. 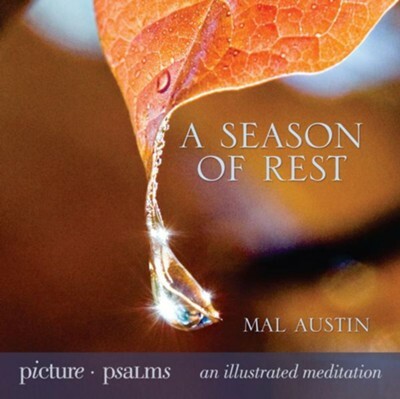 Mal Austin is from Australia and has combined his beautiful photography with text from the book of Psalms. The result is a combination perfect for a beautiful tabletop book that also serves as a devotional book designed to bring comfort, hope, and encouragement any recipient. A gift page will be included, making this a unique gift for many occasions.Each book in the series features three to five different psalms carefully chosen to bring the reader closer to God through the words and the image paired with it, making this beautiful gift book a spiritual retreat for the soul.Picture Psalms: A Season of Rest will partner the finest in fall photography with moving scriptures to give readers a refreshing time of quiet retreat. A new giftbook series by famed nature photographer Mal Austin. Mal Austin is from Australia and has combined his beautiful photography with text from the book of Psalms. The result is a combination perfect for a beautiful tabletop book that also serves as a devotional book designed to bring comfort, hope, and encouragement any recipient. A gift page will be included, making this a unique gift for many occasions. Each book in the series features three to five different psalms carefully chosen to bring the reader closer to God through the words and the image paired with it, making this beautiful gift book a spiritual retreat for the soul. Picture Psalms: A Season of Rest will partner the finest in fall photography with moving scriptures to give readers a refreshing time of quiet retreat. Mal Austin is one of Australia's most prominent Christian artists with a camera. nature and crafting it into posters, gift cards, calendars, and books. capture many isolates with untouched landscapes. I'm the author/artist and I want to review A Season of Rest - eBook.